Sonia’s sister and husband along with her nephew and fiancé were arriving from Mexico on July 23rd.. Since this might be their only visit to the Pacific Northwest before we leave for extended travel around the world we wanted to show them as much as we could of the beauty surrounding Seattle. So, contrary to our usual philosophy of slow travel, we planned a trip packed with tours of the best of western Washington State. Hopefully it won’t be too much. July 23rd: I battled my way through Seattle’s infamous traffic in heavy rain to SeaTac airport and picked up Sonia’s sister Sagrario, her husband Randy (the other gringo in the family) along with Jacobo (Sagrario’s son) and his fiancé Renée. We battled back to our home in Mukilteo normally a 45-minute drive from the airport but an hour and a half today. Immediately after dropping their luggage at the house we went to the Diamond Knot Tavern at the Mukilteo ferry landing just below our house and enjoyed what I consider the best craft beer in the United States and a beautiful sunset at Lighthouse Park in Mukilteo. As we enjoyed the fiery sunset over the Olympic Mountains the evening sun reflected off of incoming ferries and the Mukilteo lighthouse and a harbor seal swam up to us at the community pier, looked at us curiously, and disappeared. We didn’t know then, but it was a sign of things to come. We started the trip with a couple of easy-going days in home in Mukilteo knowing we’d soon be driving long distances to Olympic and Mt Rainier National Parks and to the San Juan Islands. Since there were six of us we also rented a mini-van for a week to haul us and our gear – this turned out to be a very good idea. July 24th: After breakfasting on pancakes made from scratch (I’m the pancake chef) we drove the ½ mile to Boeing’s Future of Flight museum at Paine Field in Everett. Although the museum itself isn’t that interesting, the tour of the adjacent Boeing manufacturing plant is. Outside of the museum the airfield is full of brand new airliners waiting for delivery to airlines around the world. Costing $20 each the tour walks you through what is purported to be the largest enclosed area in the world where Boeing 747s, 777s and the new carbon fiber 787 Dream Liners are assembled and it was truly fascinating (sorry, no photos allowed inside the factory – photos of factory interior are from displays in the museum). Although this tour only took a couple hours, it was enough for day one and we enjoyed a day at home visiting and relaxing. July 25th: Now the traveling begins with our first tour being a two-hour sea kayaking trip from nearby Whidbey Island into the open salt water of Saratoga Passage, a channel off of Puget Sound. We got everyone to the Mukilteo ferry by 8:00 a.m. and purchased walk-on passage (we didn’t take a car). After the 20-minute ferry ride to tiny Clinton on Whidbey Island we took the free bus service to the colonial town of Langley just 20-minutes from the ferry landing where we met our kayak guides at the Langley Marina. Most of our group had never been in a kayak before, but after a brief safety presentation we boarded our kayaks and began paddling away from shore into glassy smooth water. The clouds had lifted, the rain stopped, the sun coming out, and as we pushed off from shore we noticed a small harbor seal swimming around about 300 yards offshore. When we reached this spot a young pup seal, about fifty pounds, swam right up to us and then tried to haul himself out of the water and onto our kayak using his flippers to hold onto whatever he could. But our kayak’s sloped deck was to slippery for him and he soon found that our guide’s kayak with its flat deck was much easier and soon he had hauled himself out of the water and onto the kayak where he sat contentedly for a while before slipping back into the water. He repeated this game a few more times before we paddled away into deeper water (for more detail on this see Seals, Whales and Kayaks in What’s New). We returned home for a backyard bar-B-que where we introduced Sonia’s family to some friends and soon the yard was full of laughter and story-telling in Spanish and English depending on who was talking to whom. July 26th: The first big tour. We picked up a six passenger mini-van from the Avis car rental center, loaded it with our overnight bags and cooler stocked with food and beer, and headed off to the Mukilteo ferry again. This time we drove twenty miles north on Whidbey Island to Coupeville where we took another ferry to campy, boutique Port Townsend, a restored Victorian small city by the sea set on point off of the Olympic Peninsula. Even the ferry ride from Coupeville was artsy with a harp player gently playing lilting melodies in the observation deck as the ferry crossed upper Puget Sound towards Port Townsend. We knew this would be a long, long day since our destination for the night was a B&B in Forks near the Pacific Coast. But first we walked around Port Townsend for a couple hours enjoying the street musicians and fine old Victorian buildings before driving westward through another small seaside city, Port Angeles, and then around beautiful Lake Crescent on Washington’s Olympic Peninsula. We arrived in Forks by 6:00 p.m. and signed into our rooms at the Miller Tree Inn on the edge of town (known as the vampire’s house from the Twilight novels). Then, tired as we were, we piled into the van and drove the 18 miles out to Rialto Beach on the Pacific Coast to eat a picnic dinner and catch the sunset. It was magnificent with the offshore “sea stacks” lighting up with fading sunlight and the piles of massive driftwood logs turning pink along the shoreline. We stayed on the beach until 11:00, tired but not wanting to leave. July 27th: After a breakfast of eggs, sausage and fruit at the Miller Tree Inn we loaded into the van for another long day of travel our destination being the capital city of Olympia. But first we had some stops to make. We drove up the Hoh River Road an hour south of Forks stopping at a sign stating simply “Big Tree.” The group was amazed at the massive spruce tree there and a short trail behind it took us through a fern-lined forest of more moss-covered giants to the sparkling clear waters of the Hoh River where we spent a couple hours exploring the rocky shoreline. After the Hoh River we stopped at upper Kalaloch Beach on the Pacific Ocean and walked the broad, sandy shore in a wind blowing so cold we had to wear our coats despite the brightly shining sun. We found a massive windswept spruce tree that appeared to be levitating over a gully in the bluff along the beach that had eroded away from underneath the tree. As we got closer we found that the tree was actually suspending itself over the gully by its roots grasping either side of the deep gulch, but the main trunk and roots were hanging in mid-air. We found a large driftwood log balanced sideways across another larger log forming a natural seesaw and soon Sonia and her sister Sagrario were playing like children on it. The next stop was Lake Quinault where we had our picnic lunch at lakeside and walked to yet another gigantic tree, this one being the world champion Sitka Spruce tree over 1,000 years old. We marveled at this sheer size and age of this tree, walked to nearby waterfalls, and loaded up for our final drive to Olympia passing through the ugly twin cities of Hoquiam/Aberdeen which mark the southern end of the Olympic Peninsula. Arriving at Olympia at dusk we checked into our rooms at the funky but clean Governor Hotel conveniently located in downtown. We finished the day at the Urban Onion bar and restaurant for an evening of micro-brews and karaoke in English and Spanish. July 28th: After breakfast at our favorite breakfast spot in Olympia, The Spar Restaurant, we toured the Washington State Capital Building. I’m usually not enthusiastic about government buildings, but I have to admit the Washington State Capital is unusually impressive. The Italian marble gallery is capped by a massive dome resembling the national capital building in Washington D.C. and the grounds are immaculate. And all with a spectacular view of the Olympic Mountains far away across Budd Inlet and the Olympia waterfront which forms the southern terminus of Puget Sound. By now we were exhausted and loading into the faithful van we made the 2-hour drive back to Mukilteo for a quiet dinner and a movie at home. July 29th: We had originally planned a day of rest for this day, but Jacobo had to leave a couple days earlier than the rest of the group for an appointment in Mexico City and he didn’t want to miss anything. So, we again loaded the cooler and packs into the van and off to Anacortes, another small seaside city an hour to the north of Mukilteo. Here we would catch the 12:00 ferry to the San Juan Islands, a group of large and small islands stretching into the deep salt water passages between Canada and the U.S. As we approached Anacortes we took a short detour to Deception Pass, a dramatic salt water channel separating the mainland from the northern tip of Whidbey Island where the current forms whirlpools and seals play in the rushing waters. Returning to Anacortes we boarded the ferry on a bright, sunny afternoon bound for Friday Harbor on San Juan Island over hour away. On San Juan Island we would drive to Lime Kiln State Park on the western side to look for whales, but our final destination for the night was the Outlook Inn on Orcas Island which meant another ferry ride in the afternoon. The ferry ride from Anacortes to San Juan Island was breathtaking with the massive, glaciated volcanic cone of Mt Baker rising above the blue water as the ferry wove its way through the forest-covered islands. The small harbors at the various islands were full of fine boats, some of them wooden sailing schooners or old fishing boats converted into luxury yachts. Upon arriving at Friday Harbor we drove ½ hour to Lime Kiln State Park, hauled our cooler to a picnic table overlooking the expansive salt water of Haro Strait which separates Vancouver Island in Canada from San Juan Island in the United States. As we ate our ham sandwiches and watermelon a harbor seal fished in the kelp (seaweed) along the rocky shore below us and the glaciers on the Olympic Mountains far across the strait shone in the afternoon sun. Then we spotted a group of killer whales (orcas) spouting and splashing about a ¼ mile offshore. Unfortunately they were moving away from us rather than towards us and they soon disappeared. Later we walked to the lighthouse on the edge of the bluffs over the sea where a whale sighting log is kept to find out that three groups of killer whales had passed by the island only an hour or so before we arrived. Still, we had seen some of them if only at a distance and besides, the place was so beautiful just being there was reward enough. But, time for the next ferry to Orcas Island so we drove back to Friday Harbor for the 6:30 ferry stopping to photograph a bald eagle perched in a tree by the road as we went. As we took our pictures he eyed us with that particularly stern and disapproving look that eagles always have. Then we drove on to the ferry and finally arrived at Orcas Island at 7:30 in the evening. We checked into our rooms at the Outlook Inn in the tiny town of Eastsound and then checked into the local pub for an evening of raw oysters, fried calamari, micro-brews and shooting pool. July 30th: With no tight schedule for the day we rose late and had a leisurely breakfast in Eastsound. Then back into the van and up to Mt Constitution in Moran State Park. The views from the summit of Mt Constitution are amazing with vistas far into the Canadian Cascade Mountains, across the San Juan Islands to glacier covered Mt Baker and Mt Rainier shining in the noonday sun far, far away to the south. Rank upon rank of snowy Cascade Mountains lined the eastern horizon as a bald eagle glided through the air below us. We could have spent the whole day hiking the trails there, but it was time to catch the afternoon ferry back to Anacortes and home, so we drove to the ferry landing and on to Mukilteo. After a relaxing dinner at home we took a hike through Japanese Gulch, a large area of protected canyon and forest with a salmon stream at the bottom just behind our house. Tomorrow, the final tour of the trip, . . . Mt Rainier, so everyone turned in tired but ready for more. July 31st: Since we had to take Jacobo to the airport this day, we decided to spend it in Seattle. We drove to one of our favorite restaurants for breakfast, the 5-Spot on top of Queen Anne Hill, where we had a delicious breakfast. 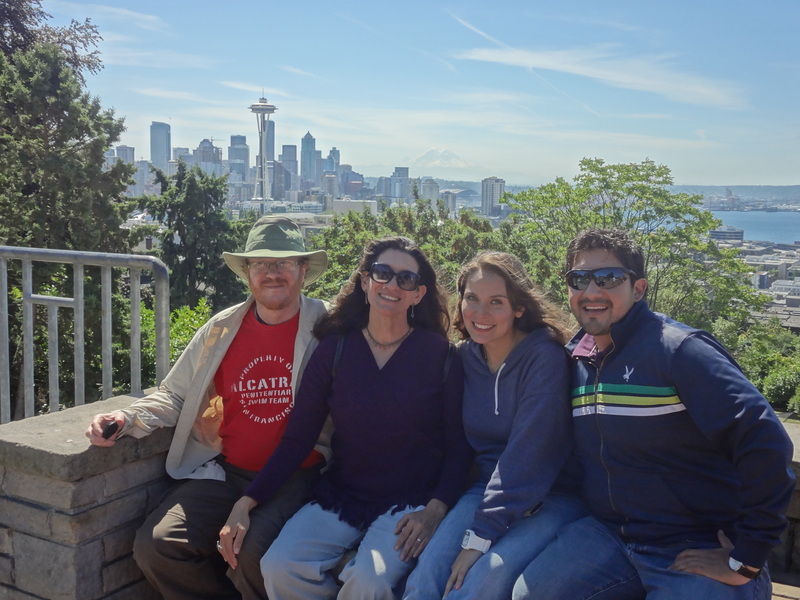 After that we stopped at nearby Highland Park for the iconic overlook of Seattle – the Space Needle and downtown with Mt Rainer forming the background. We hadn’t realized that this weekend was Sea Fair, one of the biggest festivals in Seattle, but the Blue Angels acrobatic jet team roaring overhead soon alerted us that something was up. We parked near the Seattle Center immediately below Queen Anne Hill (Seattle’s central public park, arena and performing arts center). As we walked up to the Space Needle a group of young street musicians were singing some snappy 1930’s jazz with trombones and saxophones while a group of Peruvians nearby played ethereal tunes on pan pipes and guitars. To top it all off, the Marine Corps Band then marched up through the crowds in tight formation and began to play flawless symphonic military band music at the base of the Space Needle while the Blue Angel jets roared by overhead – very impressive. After enjoying the music we made our way to the Chihuly House of Glass pavilion at the base of the Space Needle (Dale Chihuly is a world renowned glass blowing artist based in Seattle). Whether you appreciate glass art on not, the Chihuly House of Glass is amazing. Focusing on “sea shapes” Chihuly has created unique forms in glass of every color imaginable. Some works are relatively small, but most are massive – overwhelming in their size, shape and bright colors yet exquisite in their detail. We spent two hours walking through the displays before heading off to Seattle’s other iconic spot, Pike Place Public Market. It was downright hot in Seattle – almost 90 degrees and Seattle was exceptionally crowded for Sea Fair. The combination of heat, crowds and tiredness from days of traveling was taking its toll on us so we walked to the original Starbuck’s coffee stand in the market, bought some souvenirs and then headed back towards the van which we had parked eight blocks away to avoid the crowds. Along the way we stopped in for a beer at the Cyclops Bar and true to Seattle’s eclectic style found a memorial on the wall inside commemorating a miraculous apparition of Elvis created by a stain on a cookie sheet in the shape of The King himself discovered when the bar’s owner was baking an apple pie. Yep, you can’t get more Seattle than that (and I have to admit, it did look a lot like Elvis). After resting at the bar for a while we battled the Sea Fair traffic out of Seattle and to the airport where we dropped Jacobo off to fly out to his meeting in Mexico. Then it’s back to Mukilteo for dinner at home. August 1st: The last early morning get-up. We discussed whether everyone was too tired to go to Mt Rainier, but the vote was unanimous – they want to go. So I went out to load up the van for our last expedition and . . . a flat tire! So while the rest of the group went to the supermarket for some last minute supplies I put on the spare tire and drove to the local shop to fix the flat. We re-grouped at 11:00, tire repaired but now a late start. Still they wanted to go, so off we drove the three hours to the Sunrise Visitor’s Center on the northeast side of Mt Rainier National Park. As it turned out it was a good decision to go. Mt Rainier was in its full glory with the crevasses on the glaciers easily visible, the alpine meadows warm and welcoming in the summer sun and the end of the wildflower bloom in progress. Welcoming except for the mosquitos that is which were plentiful and aggressive. Still, we hiked a couple hours to Frozen Lake and around to some viewpoints of The Mountain. Through the telescope at the visitors’ center we could see climbers descending the glaciers from the summit. As some late afternoon thunderstorms rolled in we left, made our way home and finished the trip as it had begun with a couple micro-brews at our local pub. August 2nd: The trip is over and exhausted but content we loaded everyone into the trusty mini-van for the last journey – to the airport. After a warm goodbye and promises to see them at Christmas in Mexico, Sonia and I would return the van to the rental agency later in the day, but first we came home and went right to bed for a siesta. It was a great trip – we broke the fun barrier and everyone loved it, but it was tiring. Too much driving, but we did show them some of the best of Washington State. 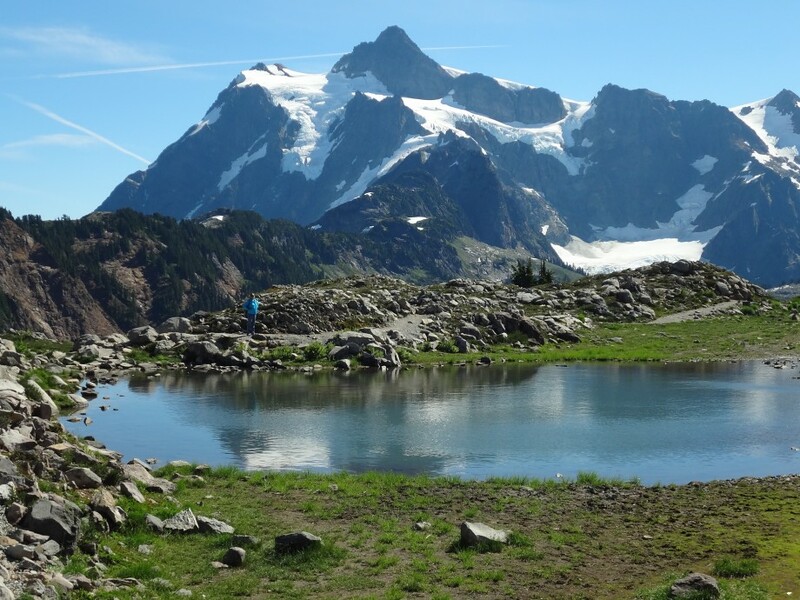 And in just a few weeks friends from France are coming for a three-week visit with more sea kayaking and backpacking trips deep into the wilderness of the Cascade Mountains. So, time to rest up for the next exploration of Western Washington.